Our wines are graded in Smiley faces ! 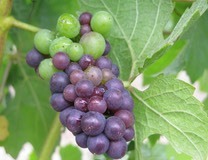 Wilson Vineyard was a revelation in terms of quality of Zinfandel. This Carls Vineyard was one of the best we tried here. The yummy chocolate undertones of a jammy, peppery blackberry wine give it great versatility when pairing with food. On this occasion we drank it with some well seasoned steak and the wine was robust enough to stand up to this. Classic Zinfandel at really affordable price sets this Zin aside as one to find if you can.